Thank you for your generous donation of the TI-Nspire CAS calculators for use in our MSE dual enrollment mathematics courses. These tools were greatly enhance instruction and support student learning in Calculus II/III and Differential Equations I/II. Using these calculators, students will be able to visualize important concepts in these rigorous courses. 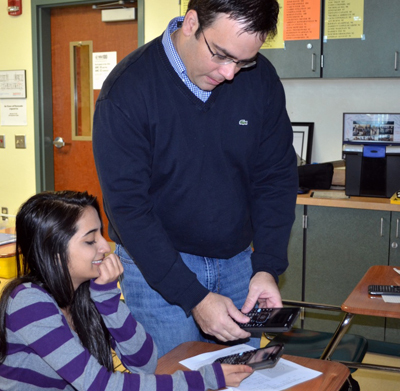 Additionally, the wireless networking feature of these calculators enables the teacher to view student calculators via remote; with this feature I can access their technology to download problems and simulations directly to their calculator while they are working, while remotely viewing their screen to troubleshoot problems they may be having. The interactive projectors arrived and we are beyond excited. They will be used across the curriculum by English, Foreign Language, Math and Science departments. Keeping our students on the cutting edge of new technology not only maintains excellence in our classrooms, but also encourages innovation and growth in the 21st century. Thank you again for supporting this grant/Foundation purchase. I'm attaching some pictures of Kristy and myself with the newly arrived projectors. Thank you very much for providing me with the IB training this summer. My session was very good. My instructors were awesome and I learned about the changes to the IB Math Studies Syllabus. The best part about the training was the interaction with the other participants as they came from all over the world! Being able to work collaboratively with other people and share ideas was very beneficial. I will be able to take what I learned and share it with my students. Thank you for the IB Diploma Programme training in computer science this summer. The real value from the training came in the form of networking with some of my colleagues from around the world. It was a valuable experience so thank you very much. Thank you for providing me with the opportunity to attend a Level 2 IB CAS Workshop this summer in Atlanta, GA. Students often view the 150 community, action, and service hours required for the IB diploma as a daunting task. My workshop instructor focused on ways to make the CAS requirement a positive experience, which ultimately helps students grow both personally and academically. Conversing and sharing ideas with other CAS coordinators from around the country also provided me with a host of ideas regarding how we can continue to improve our program. I also appreciated that the instructor continuously connected CAS to IB Theory of Knowledge, a course that I currently teach. Overall, the time in the workshop was well spent and will certainly benefit our students. Many thanks for enabling our faculty to continue this essential professional development. Due to your generosity, this summer I attended IB training in Tampa. As a faculty, we are so lucky to be able to attend trainings many of which teachers at other schools are not exposed to. Thank you for always supporting our staff and providing opportunities to enhance our skill set so we can continue to bring new ideas into our classrooms. I know the positive benefits will be passed on in countless ways. I greatly appreciated the opportunity you gave me to attend the IB training for Physics this past summer, which I otherwise could not afford. It proved invaluable in sharing best practices in physics with colleagues from many different countries, many of whom had years of experience in their field. The facilitators were excellent, providing important information and resources that I am already putting to use in my classroom. I have gained connections with the IB community that I anticipate to be long-lasting! I want take this time to thank the foundation for making it possible for me to attend the FLIBS workshop this summer in St. Pete, FL. It was a great experience despite the fact that we were slightly bothered by the tropical storm. I was able to learn about the new curriculum for the course that I teach. Now I am better prepared to help my students get ready for their new exams. Again, thank you for making this possible.